I trained with my Guide Dog Oscar in September 2007, after being on the Guide Dogs waiting list for approximately 16 months. Oscar is a large, and beautiful black Labrador and was trained in Ireland. 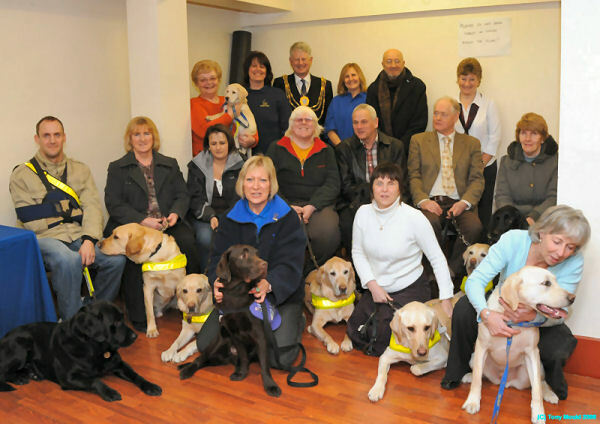 Unlike the majority of Guide Dog owners, I was fortunate to be trained in my home area. It is hard to believe, but I only had to pay 50p for Oscar, so as a way of saying thank yo,u I decided to look at setting up a fundraising branch for Peacehaven and Brighton, in order to hopefully raise money for Guide Dogs. It took me a little while to get the branch launched and up and running. Initially I had to find a Treasurer and a Secretary which was not as easy as it sounds. Fortunately my friend Donald kindly agreed to be our Treasurer, and a local lady who has already raised over £35,000 for Guide Dogs agreed to take on the role of Secretary. I also received support from Philippa Jann, the Regional Fundraising Co-ordinator employed by Guide Dogs. So, on Saturday 7 February, with myself in the Chair, Donald ready to look after the money and Pat poised to write letters, we launched the Peacehaven and Brighton branch. We held the event at Saltdean Community Hall and were fortunate enough to have the Mayor of Brighton & Hove, Councillor Gary Peltzer-Dunn to open our event, together with Tony Aston, Chairman of Guide Dogs board of Trustees with his Guide Dog. 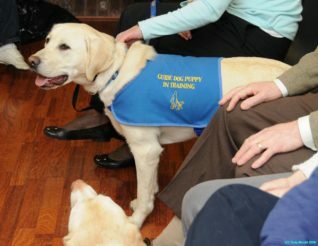 We were also joined by seven Guide Dog owners and their dogs, two retired Guide Dogs and two puppies in training. Many other friends and family, interested volunteers and members of the public also came along to wish us well and to learn more about our group. I decided to use this event to start our fundraising and we were successful to raise £170 from the proceeds of a raffle and refreshments with home made cakes. Our task now is to recruit more volunteers as without help our work is limited. All Guide Dog owners must have a sighted volunteer with them whilst they are collecting, and extra help is always needed to make any fundraising event successful. We also need to have more Guide Dog Owners involved as this means the dogs can share the work of raising funds. 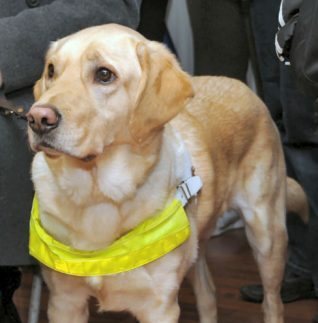 There are a number of Guide Dog owners in Brighton, but sadly we are unable to contact them directly. Hi Mike. So pleased for you. I have seen guide dogs working, they are brilliant. Good luck.